This is a classic monograph on the Mahar movement in western India. It documents the social and political forces that shaped Bhimrao Ramji Ambedkar (1891–56), the greatest leader of Dalits, and the manner in which Ambedkar shaped the destiny of the Dalits of Maharashtra and India. Zelliot chronicles the movement from its origins with the first Mahar petition in 1890 till its culmination in the mass conversion to Buddhism in 1956. She describes the defining influences of the pre-Ambedkar leadership, the Mahar army tradition, the cult of Cokhamela, the Mahad satyagraha, the temple-entry movements, the various newspapers Ambedkar edited, the Round Table Conferences, and the political parties Ambedkar founded. Using a wide array of primary sources, she offers a rich history of one of modern India’s most defining movements. 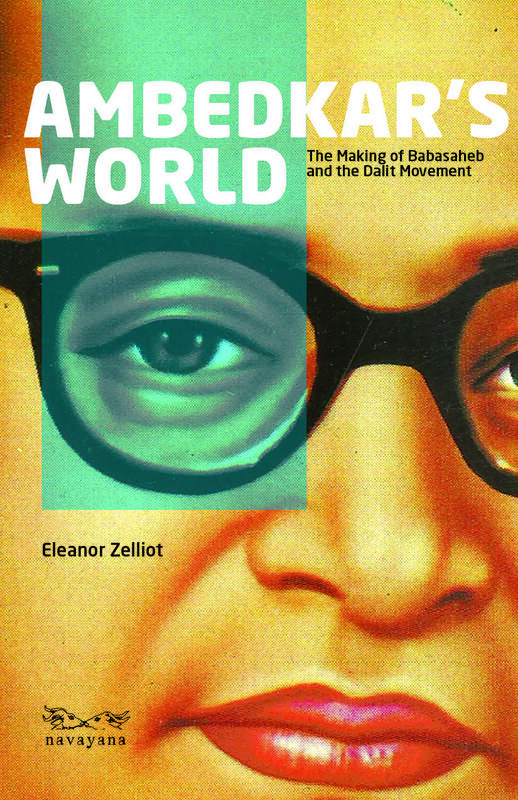 In its scope and depth as a single-caste history, Ambedkar’s World remains as yet unsurpassed. Eleanor Zelliot in the 1960s, pioneered the study of the dalit movement in India. She was Laird Bell Professor of History (1969–1997) at Carleton College, Minnesota. She has written over eighty articles and edited three books on the dalit movement, on saint-poets of the medieval period, on dalit literature, and on the Ambedkar-inspired Buddhist movement. She is the author of From Untouchable to Dalit: Essays on the Ambedkar Movement and Untouchable Saints: An Indian Phenomenon. My 1969 thesis is now in its third incarnation. The original thesis title, “Dr Ambedkar and the Mahar Movement”, was misunderstood as limiting Dr Ambedkar, a most unfortunate and inaccurate reading. Ambedkar tried all his creative life to involve all castes, other areas, all levels of society. Not very successful in Maharashtra among other Untouchable castes, he became an all India leader and today he has no caste identity, no regional limit, and is a force even more powerful in many areas of India than during his lifetime. My initial intention to write a political biography of Dr B. R. Ambedkar was gradually changed during my period of research in India to an attempt to record the factors in Mahar and Maharashtrian history which produced Dr Ambedkar, and to discover the way in which he in turn changed the history of his caste. In other words, to concentrate on the movement rather than the man. This new perspective demanded a study not only of the written record, but of much that was not officially recorded and of the life of the still vital movement in which the Mahars, now for the most part Buddhists, are involved. My debt to those who shared their current life and their memories with me is great. I have recorded the names of those consulted in the appendix. My initial period of research, 1963–65, was within ten years of the 1956 conversion and Dr Ambedkar’s death in the same year. My writing reflects the energy and optimism of these early years. In 2004, I finally decided to publish my 1969 thesis, giving in to occasional but persistent demand. The final push was from the only Dalit press that published only Dalit material and in English, Blumoon Books. The title of that incarnation was Dr Babasaheb Ambedkar and the Untouchable Movement. I am grateful to Blumoon for making my thesis, and the material which attempted to update it, widely available. I had not neglected publication, even though I hadn’t published my thesis. From the moment I began my study in 1963, I was asked for articles on Dr Ambedkar or his movement. I have about eighty to my credit on this or related subjects, and I have never in the years since 1969 been without some request from an encyclopedia or a dictionary or someone putting together an anthology. I have, in the interest of recording the history of the Ambedkar movement, responded to most requests. I have also tried to keep up with the constant developments, such as that of Dalit literature, in the movement. Some of these articles appear in my From Untouchable to Dalit: Essays on the Ambedkar Movement (New Delhi: Manohar, third edition, 2001). I would like to acknowledge the essential help I have received from Anne Feldhaus who prepared the index for this publication of my thesis and Maxine Berntsen and Jane Sahi, who graciously agreed to read and correct the proofs. Maxine was assisted by Prakash Anbhule, Manjiri Nimbkar, Sameera Qureshi and Yashodara. I am grateful for all their help. The 2004 publication is dedicated to the late Meenakshi and Vasant Moon, Sudhir and Pushpa Waghmare, S. K. and Vimal Thorat, Vilas and Usha Wagh, and the late S. D. Gaikwad. This third incarnation introduces a new word into the history of the movement: Dalit. My use of the word Dalit which means ‘oppressed or broken’ is a reflection of the changes since I first worked on the Ambedkar Movement. Its use began in Bombay in the 1970s from among Ambedkar’s followers. ‘Dalit Sahitya’ describes the school which changed the face of Marathi literature and soon spread to other language areas in India. The capstone was Dalit Panthers, adopted when the American Black Panthers began a model of action. Like ‘black’, Dalit is a self-chosen word, not applicable to all within it but a useful way to refer to all the marginalized. In general writing, it basically replaces ‘Harijan’, children of god, Mahatma Gandhi’s patronizing term for Untouchables. The use of the word Dalit means that outside factors determine the status of Untouchables, not any inherent pollution. It includes the technical terms, Schedules Castes and Scheduled Tribes, which indicate the groups eligible for benefits, but is not limited to them. This incarnation, Ambedkar’s World: The Making of Babasaheb and the Dalit Movement was proposed by Navayana. With this my thesis will reach a different audience. We have included no updating, allowing the work to remain what it is: a piece of history. Another word essential for understanding the Ambedkar movement is Babasaheb. A respectful and warm appellation, it counterbalances the astonishing list of degrees that Ambedkar won. A song recites them proudly: B.A., M.A., Ph.D., D.Sc., D.Lit., Bar-at-Law. Ambedkar understood the world of Columbia University and of London School of Economics but that is not where he lived after he came back to India. He took the knowledge he gained there from John Dewey and others and applied it to the world around him in India. Village India could understand a version of Ambedkar’s overseas world through the innumerable statues that one finds in every city and most towns and villages all over India. Often these statues resemble folk art but all are instantly recognizable. Ambedkar wears a suit, which is standard for highly educated Indians except for those in politics. Horn-rim glasses indicate his high level of commitment to reading. One arm holds the Constitution of India. The other is raised in a teaching position. The statue looks western but the ceremonies conducted there are purely Indian. The chanting is Buddhist and in Pali. The messages focus on the French Revolution’s model, ‘Liberty, Equality, Fraternity’, or, more commonly, Ambedkar’s advice, ‘Educate, Agitate, Organize’. The flowers around the neck of Ambedkar are put there to honor him the Indian way. In some areas there is a permanent ladder next to Ambedkar to enable the frequent garlanding of the statue. In other words, elements from the west are thoroughly Indianized just as Ambedkar’s Western experience was used to enlighten the Dalit movement. Since my research in India, the great changes have come in literature and art, in religion and education, and in the lessening of the importance of politics. The international dimension has grown with migration but also through public efforts at making clear the progress and problems of Dalits.